Over the years he wrote some of the most memorable bush poetry such as The Man from Snowy River, Clancy of the Overflow, Mulga Bills Bicycle, The Man from Ironbark and Waltzing Matilda. Many say that he was always in friendly rivalry with Henry Lawson, trying to write more and better than Henry could. This could account for the amount of poems he wrote over the years, the quality of which noone will deny once reading them. 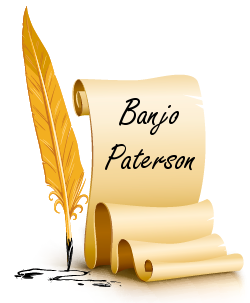 Banjo died from a heart attack on 5 February 1941. He is buried in the Northern Suburbs Memorial Gardens and Crematorium in Sydney.